The UK’s first light craft lager, GEN!US is brewed to craft quality but with less alcohol and lower calories. Zesty and refreshing, it’s not just ‘smart drinking’…it’s genius! 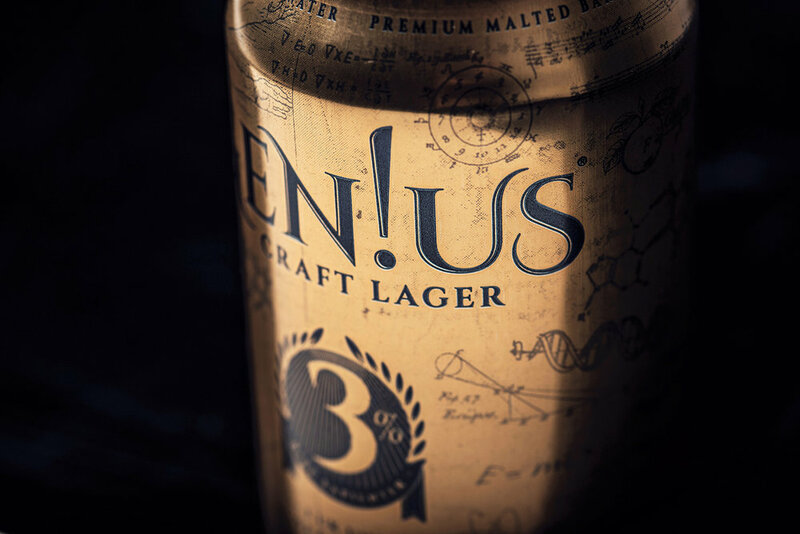 Crafted from the finest pilsner malts and Styrian Golding hops, Gen!us is matured with Australian Galaxy and Ella hops for a subtle citrus aroma. With only 1 unit of alcohol per can and less calories than an apple Gen!us makes responsible drinking a pleasure, not a compromise. 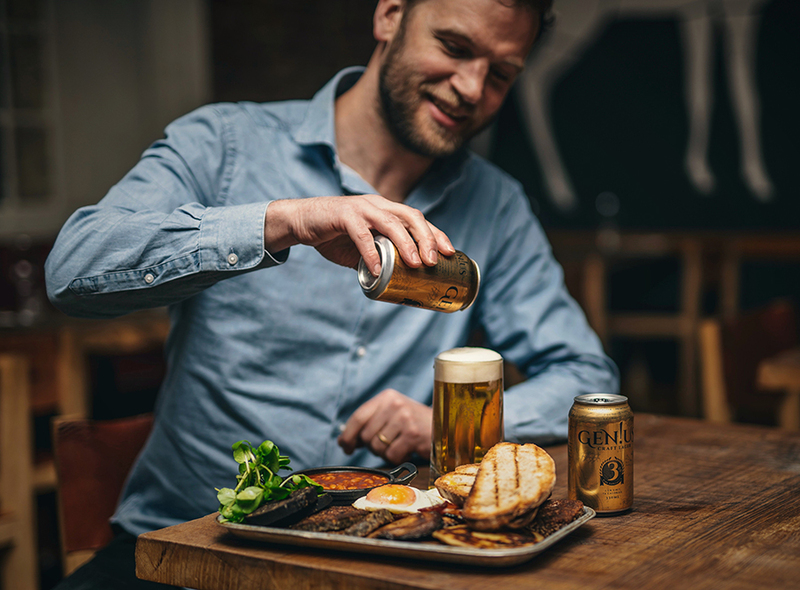 For today’s health-conscious drinker, Gen!us is great after training, with a meal out, while watching the match, or as a guilt-free pleasure after ‘one of those days’ in the office. Bibe Sapienter: Drink Wisely The ancient Romans believed a good life was a balance of pleasure, health and wisdom. We do too! 1 Unit A can of Gen!us Craft Lager contains exactly 1 unit of alcohol and 72 calories. Staying drink-aware has never been easier. Scotland rugby legend Doddie Weir has Motor Neurone Disease. Genius Brewing is proud to donate 5p from every can of Gen!us to support Doddie's mission to tackle this terrible disease. After a decade in HR consulting, building teams of bankers in London and Hong Kong, Charlie joined Fyne Ales in 2003, when craft beer was in its infancy. Promotion to Ops Director saw him running the brewery: hiring; buying; production; distribution; and marketing. Fyne Ales progressed rapidly winning contracts with the multiples and many industry awards. In 2013, he became a qualified buyer with Auditel, specialising in supply networks and cost efficiency. As the Genius Ops Director, Charlie focuses on the ‘Five Rights’: Quality…Quantity… Time…Place...Price. A Law graduate and former Army officer, Jason is an award-winning writer and filmmaker with 20 years’ experience across television, advertising, marketing, corporate communications and feature films. In 2011, he established SIGNAL2NOISE, a digital media production company based in Scotland with clients including Shell, Baxters, RBS, William Grant & Sons, and Royal Caribbean. As Genius Brewing’s Creative Director, Jason oversees the Gen!us brand, its marketing and corporate communications. As the trend for healthier drinking grows, The Sunday Mirror makes Gen!us its ‘Drink of the Week’. 220 Triathlon, the UK’s largest triathlon magazine reviewed three leading low-calorie beers. Gen!us took 1st place! Mac & Wild, London's favourite Scottish restaurants, now have Gen!us in their Fitzrovia and Devonshire Square restaurants. We’re proud to announce that Beth Allen, the 2016 Ladies European Tour Order of Merit winner, is Genius Brewing's first Brand Ambassador. The Ubiquitous Chip in Glasgow’s West End is a legendary venue which now has Gen!us Craft Lager as a #smartdrinking option. Working with Sponge Marketing in London, we’ve launched a UK-wide marketing campaign - New year. New you. Check out the video on youtube.